Happy Monday! Are you on your fourth cup of coffee? No? Just me. Hmmm. Moving on. The first thing I thought of when I saw this bread staring me down was "french toast"! Omg! Yes! I then immediately took out my phone and text messaged my hubby, with a photo of the bread, of course, and said, " Breakfast. French Toast. Tomorrow. Be There." I just got an LOL reply. I'll take what I can get. I also haven't made or eaten french toast in a while. I know, seriously, what's wrong with me?! But I made this Sunday morning, and uh, it was flippin' fantastic! Challah bread has a sweeter taste to it and just has a wonderful flavor for french toast, along with the vanilla that's in the milk mixture. Since Sunday was my rest day from working out, I really didn't care what I ate that day. Honestly though? This bread is thicker and heavier so I could only devour one and a half pieces. The hubby had two pieces and loved it, too! Our tummies were satisfied and ready to take on the rest of the day. Which, in my case, was doing laundry, cooking some more, and sunbathing for less then an hour because I became so bored. Or was it the beads of sweat dripping down profusely because of the 90 degree temps? Unless I'm at the beach, I can't really lay outside in the sun without becoming bored for some reason. I'm weird. I get it. 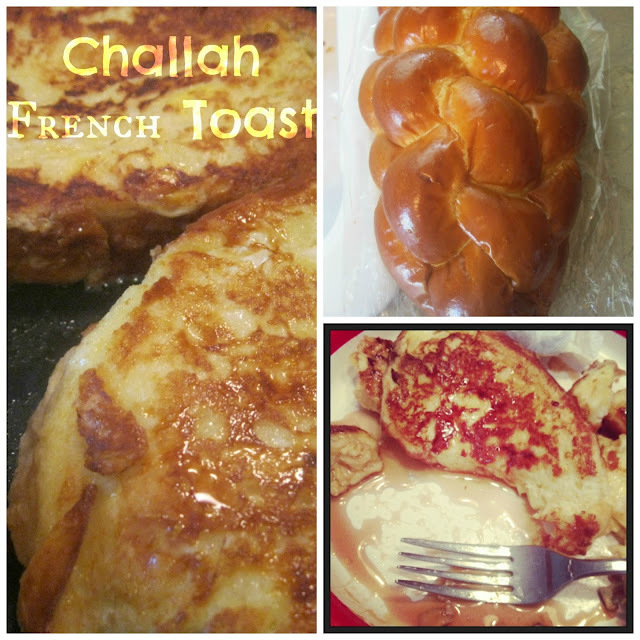 Your next breakfast should be this french toast! And you guessed it! Another Ina recipe. What's your favorite kind of breakfast? You're half Jewish??? I didn't know that!! My husband's dad's side of the family is Jewish so I consider myself half :) And we celebrate Chrismukah, haha. Anyways.... this French toast looks freakin' amazing. I'll have to try it soon! I'm totally craving French Toast right now! So tasty! Ina is perfect and this French Toast looks that way also! Thanks, Alex! It was SO good!